Nazarian College Dean Kenneth R. Lord talking with a student in front of the David Nazarian College of Business and Economics. The college is celebrating its 50th anniversary this year. Photo by Lee Choo. Fifty years ago, business in Los Angeles had a different face. Different industries employed a different workforce. Fifty years ago, a still-new California State University campus in Northridge launched a School of Business and Economics. As Los Angeles grew and changed, so did CSUN and its business college. 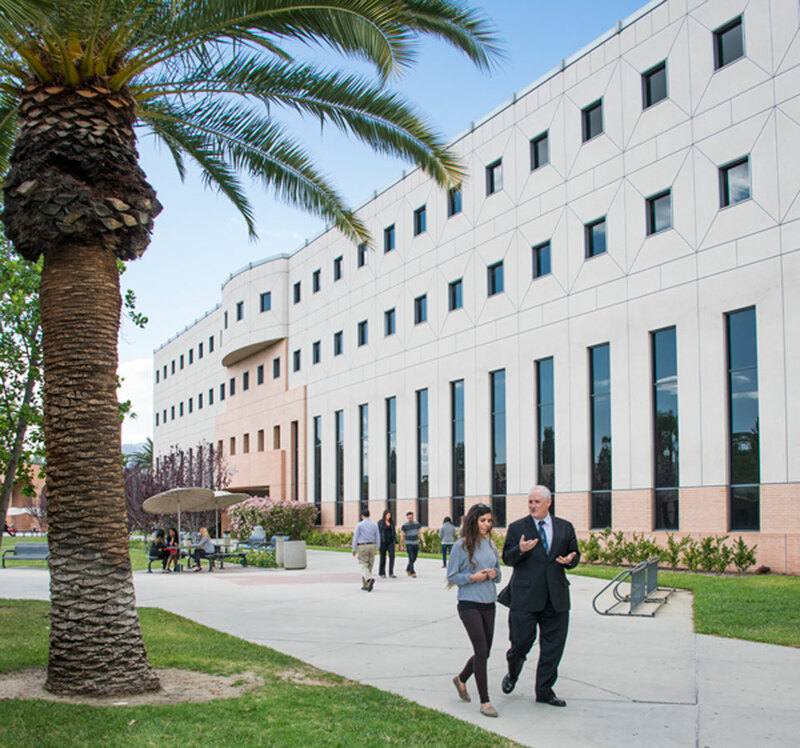 From a modest opening enrollment of 438 to the more than 7,800 students enrolled today, the David Nazarian College of Business and Economics has grown to become one of the 10 largest accredited business schools in the nation, consistently ranking among the top programs in the state. CSUN’s business college is celebrating 50 years of changing lives this month with a gala celebration on Thursday, Sept. 22, at the Beverly Wilshire Hotel in Beverly Hills. CSUN President Dianne F. Harrison said the college’s anniversary is emblematic of the impact the university has had on the region and the state. 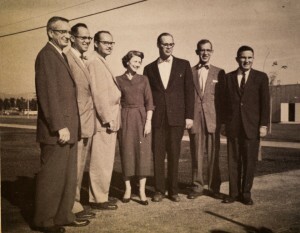 Some of the college’s founding faculty, from left, Al Meininger, Maurice Dance, Rodney Luther, Dorothea Extence, Donald Raun, Reuben Krolick and Seymour S. Phillips. Photo courtesy of CSUN’s archives. So much has changed in the 50 years since what was then known as San Fernando Valley State College started looking for faculty to help establish its new business school. But some things remain the same. That connection, he said, pays off in learning opportunities, internships and jobs for the college’s students. In 1974, only 20 percent of the college’s students were women and 60 percent were white. As of 2015, 42 percent of the college’s students are women and only 28 percent identify themselves as white, with Latinos comprising nearly 40 percent of the college’s students. Management professor Lois Shelton talking with students. Photo by Lee Choo. 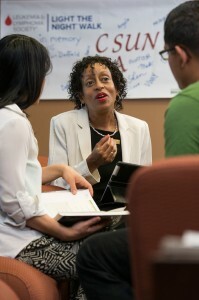 Management professor Lois Shelton credited the Nazarian College’s national recognition — it is regularly featured in Princeton Review’s list of Best Business Schools and its part-time MBA program is considered one of the best in the country by U.S. News & World Report — to its students and the commitment of its faculty and staff to ensure that those students succeed. “Our students are hard working, intelligent and capable,” she said. “They are willing to work for what they get. As far as our faculty and staff are concerned, there is a tremendous amount of creative work that goes into responding to the needs of the students and the community around us, to create and offer the programs and instruction to meet those needs — whether it is in creating an entrepreneurship program, launching a real estate curriculum, developing new master’s programs or developing international partnerships with institutions throughout the world. The Nazarian College is recognized for excellence by multiple external organizations. Its accreditation by AACSB (Association to Advance Collegiate Schools of Business) International places it among the top 5 percent of global business degree-granting institutions. The college’s accounting, finance and financial planning programs are regularly ranked among the nation’s best by experts in those fields. National and state leaders in all sectors count themselves among the college’s more than 55,000 alumni. They include entrepreneur and philanthropist David Nazarian, founder and CEO of Nimes Capital, whose pledge to raise $25 million, including $10 million of his own money, inspired the university to name the college for him. Nazarian, who earned a bachelor’s degree in business administration from CSUN in 1982, credited his alma mater for giving him a solid foundation on which to build his successful business and philanthropic career. He has said that the university’s ongoing commitment to provide a quality education to its students — who reflect the demographics of California — has cemented his support of the college. As part of the 50th anniversary gala, the college is recognizing its Fabulous 50 Business Alumni, an impressive list of Southern California, national and global business leaders. CNBC anchor and CSUN alumnus Bill Griffeth will serve as master of ceremonies for the evening. To learn more about the gala event, visit www.csun.edu/business50. Sponsors for the gala include Y&S Nazarian Foundation, KPMG, The Sterling Group, Aristotle Capital Management, Bank of Hope, Ernst and Young, HCVT, OneSource by PCS, sbe, Stefan R. Bothe, Agora, EastWest Bank, Epson, Farmers Insurance, Delta Dental, PCS Energy, PennyMac, PerkinsCoie, UBS, The Bookstein Family Foundation, Maryam Maddahi, Jeff and Joni Marine, Asset Campus Housing, B&B Premier Insurance Solutions, BB&T Insurance Services of California, Crescent Hotels and Resorts, Deloitte, Laramar, The Lincoln Motor Company Executive Business Program, Merck, MGA Entertainment, MidFirst Bank, Moss-Adams LLP, Ninjio, Northern Trust, Oaktree, Premier Business Centers, PWC, Space Needle, Chihuly Garden and Glass, teamCFO, Venable LLP, Heather J. Briggs, Chuck and Kathy Friedlander, David Friedman, Sharon Nazarian, Shulamit Nazarian, Alan M. Schnaid, Lily and Allan Schweitzer, Natasha and Shawn Sedaghat, the Shahery Family Foundation, Wells Fargo, Allied Orion Group, Earl and Karen Enzer, Jack Suzar and Linda May, and Alex and Arda Yemendjian.